Danyel Pink Designs: New Item in my Shop - The "Ella Hat"
The "Ella Hat" is a soft crocheted beanie with a large, ruffled brim. It's the perfect all-seasons hat! Warm for cool months, but can be made with cotton for the warm months. 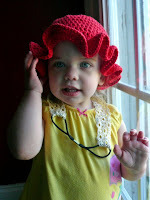 Plus, the ruffle brim keeps the sun out of your eyes. This hat is available for customization in my shop right now. The pattern for this hat will be available later this week. What a cute picture and I love the hat! !